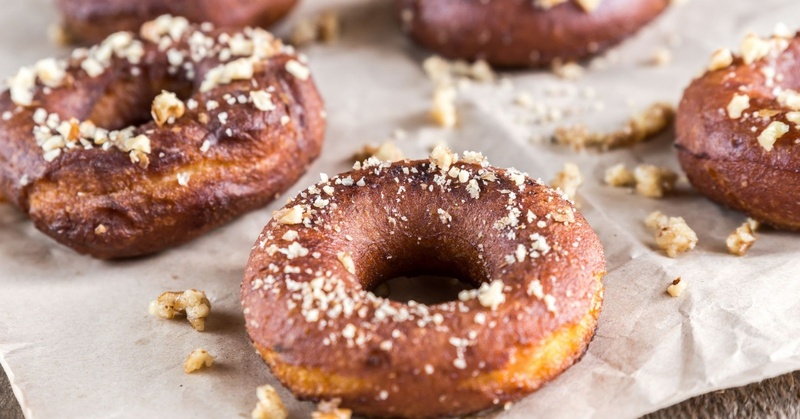 Making Delicious Doughnuts At Home Is Easier Than You Think! If there’s one thing that summons up a crisp, autumn morning best, it’s a warm doughnut and a cold glass of cider. It was with that image that we created a recipe for the most scrumptious baked doughnuts! The trick to cooking up these sweet treats is to use a ziploc bag to squeeze out your dough, and to bake them in a doughnut pan. This specialized pan creates adorable looking doughnuts and also ensures thorough cooking throughout the batter. They’re cheap, they’re easy to use, and you can get your own here! Combining the flavors of apple cider, nutmeg, and walnut, these doughnuts are the perfect morning treat! And because they’re baked, you don’t have to feel guilty eating fried foods so early in the day. You can get creative with the toppings, using frosting, sprinkles, or jam to customize your doughnuts to your breakfast. We prefer walnuts and a strong cup of coffee. However, they’re delicious however you make them! Preheat your oven to 350º F and grease a doughnut pan (or oven sheet) with cooking spray. Combine your flour, baking soda, baking powder, and nutmeg in a large mixing bowl. Stir together ingredients so they are thoroughly mixed. In a separate bowl, combine brown sugar, yogurt, apple cider, and your egg. Whisk together these ingredients for two minutes. Add 2 tablespoons of melted butter and both the vanilla and almond extracts to your wet ingredients. Whisk again for another 30 seconds. Add the wet ingredients to your dry ingredients. Stir both mixtures together so they are combined, being careful not to over-mix them. Pour your batter into a gallon-sized ziploc bag. Push all of the batter into the corner of the bag then cut the corner of the bag with a pair of scissors. Squeeze a rope of dough out of the hole in the bag. If you are using a doughnut pan, simply squeeze the dough in a circle around the mold (if you are using an oven tray, squeeze the dough out in the shape of a circle, making sure to connect the loose ends). Bake your doughnuts for 10 minutes, until they become golden brown and springy. Remove from the oven and let them cool before adding toppings. Put your remaining 2 tablespoons of butter and honey in a glass dish and microwave for 30 seconds. Brush the tops of your doughnuts with the honey/butter glaze. Sprinkle with crushed walnuts.